Today, we made a trip out to Two Bar Hill. "Two Bar Hill" (or Three or Four) is the name we give to a spot near our current location where we can get a Verizon signal strong enough to check emails and make phone calls. Of course it must be a place where we can safely pull off the road and get out of traffic. 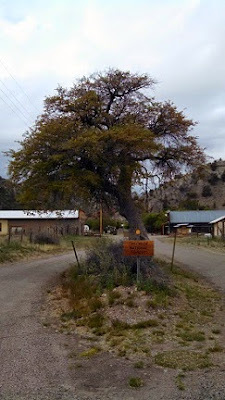 In our present situation, it's two bars with flashes of three, at a particular spot 9.3 miles from Chloride on the road to Truth or Consequences (NM Rt 52). There was an email from Jim and Bonnie Spain saying they were headed our way. Jim and Bonnie are friends of ours from The Great Outdoors RV Resort, our winter home in Florida. Early this spring when we compared summer travel plans we discovered that we would cross paths in New Mexico. So we resolved to meet. 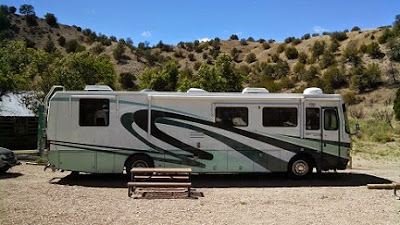 We called them immediately and learned they were in Ft Stockton, TX, gassing up on their way to El Paso, TX for the night. They expected to be passing through Truth or Consequences, NM tomorrow. 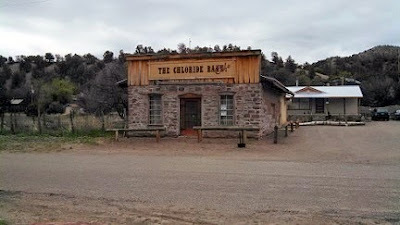 I described to them our location in Chloride, NM. Although 37 miles from I-25, the road is all blacktop and easily navigated by their Monaco Windsor, but be prepared for a winding and hilly road. I advised that if they needed provisions they should attend to that at the Walmart in Truth or Consequences. I assured them that our little RV park could accommodate their rig and encouraged them to spend the night with us. I gave them Don Edmund's phone number to call for a parking space. This morning started windy and cold with mixtures of rain and sleet. 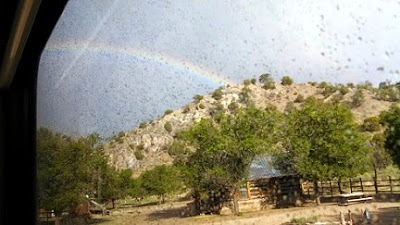 I got this shot of a rainbow from our window. Mid– afternoon, Don came by to tell us he had a message on his answering machine from our friends saying they were getting off I–25 heading our way but he didn't know when the message was left. A few minutes later, Jim and Bonnie arrived. We saw them coming and Jim greeted us with one of the several tunes on his Monaco air horn. It was good to see them. They quickly got their rig set up then we visited for a while. As evening approached, we walked across the street to the Chloride Bank Cafe for dinner. 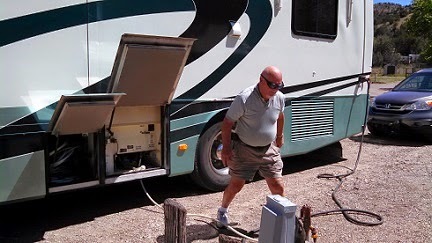 Don Edmund loaded us (Jim, Bonnie, Michelle, Bob) on his golf cart and gave us the full history tour of Chloride. That took a couple hours because Don knows the history of every building in Chloride and he loves to tell it. He is very interesting and we enjoyed every minute. 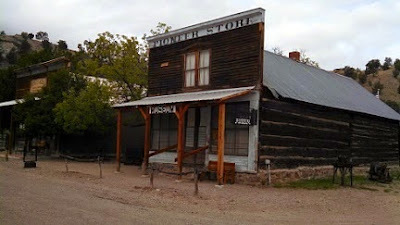 We finished at the Pioneer Store Museum and spent another couple hours looking at all the artifacts and hearing the story behind them. This museum is a place where seniors could spend a day because the items of our lives are there. Younger adults could spend a couple hours. Kids would go ballistic in about half an hour. After a lunch break, we found and logged the geocache by the Hanging Tree, then drove to Two Bar Hill so Jim could log into the Geocaching website and get coordinates for other geocaches in the area. On the way back, we stopped at the General Store in Winston as a curiosity. Our search for geocaches was unsuccessful – a couple we couldn't find and a couple got the "I'm not climbing that mountain for a geocache" verdict. Michelle and Bonnie had planned a picnic dinner at our camp site and we invited Don, Dona, and Linda to join us. 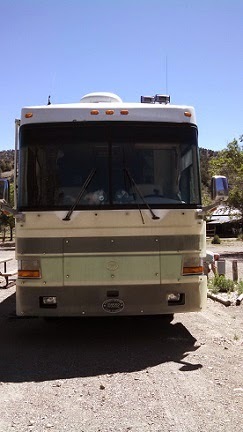 So we spent the evening eating, socializing, and trading RV stories. It was a great evening. When the sun sank behind the mountains, the temperature plummeted and ended our evening. No camp fires here! Fire danger is too great. We were up early. Jim and Bonnie packed up the Monaco. We said our good–byes, promised to stay in touch through the summer, and said we would meet again back in TGO in November. They pulled out at 0745 and gave us a toot on the Monaco horn as they left. 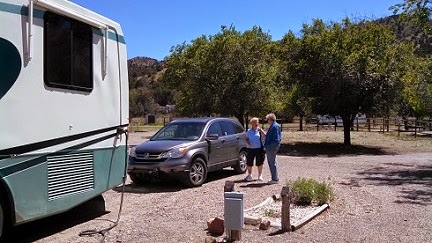 This is a great part of RVing – meeting friends on the road and sharing a new location and adventure.